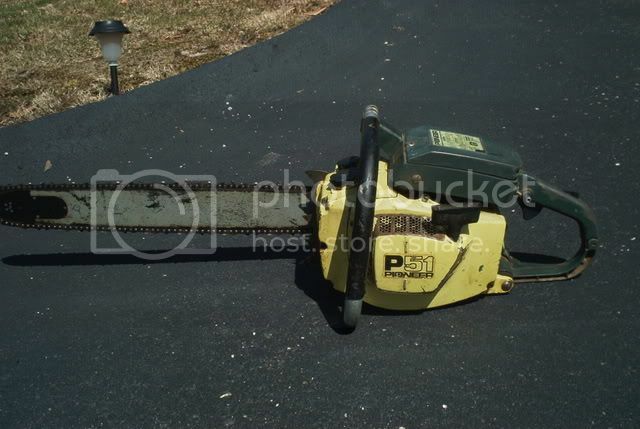 I am just starting to get into collecting and restoring old Pioneer chainsaws.It would be great if some of you guys that are into Pioneer saws could show some pictures of your Pioneers.I currently am starting with a P25and1073.It seems to me that there are a few saws in the pioneer line up that have the same specs but just a different model number. Does anyone know why? For example the P25 and the 1073 .I think they are identical except for the starter .I have briefley looked thru printed manuals I have and sort of came to this conclusion.May be I should be a little more thorough before starting this up.But would like to see some pics from Pioneer lovers. Craigwell, ray benson, DroppedP51 and 3 others like this. Welcome Pete, if you haven't already check out Mike Acres site for model specific details, there is a wealth of info there. Be careful here, though. When I started hanging out here I had 4 saws, and now I have over 80!!! Also Magnus has a great collectors forum with a lot of Pioneer info. Craigwell and dancan like this. Here are some pics of my P51 that I sold not too long ago. I kinda wish I didn't get rid of it. huck01955, MS260 Fan, madmax and 1 other person like this. Jason Yannuccelli, MS260 Fan and metalspec like this. thanks to Stihl#1,metalspec,mile950county for the replies.Thanks Stihl#1 for the link to magnus.Somehow I thought there would be a bigger response to the post guess the following for the old Pioneers is not that great,all though I know pioneerguy600 and propliner are into Pioneer saws.I have checked out Mike Acres site often it is a good one for sure.I have two cases which seem to be for those P25,P26 1073 etc.I will slowly try and make complete saws out of them.Can you buy pistons and cranks for these,as in new or do you have to buy old part saws/ I guess there are Nos parts some where. There are a few of us collecting Pioneer saws. 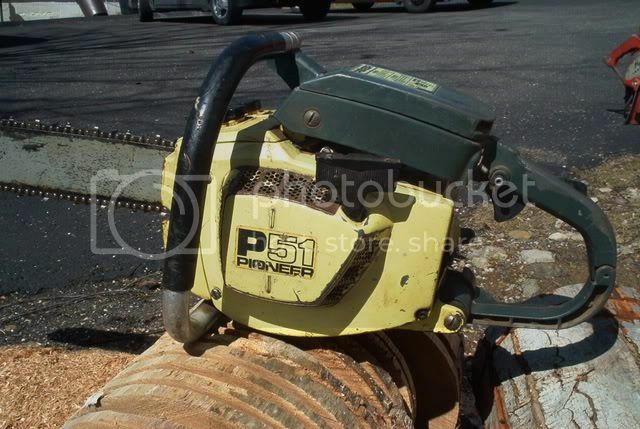 I started out with a P28 and now have many of the P series saws. Bought a lot of them at flea markets, etc. Some needed modules, others carb kits, etc. 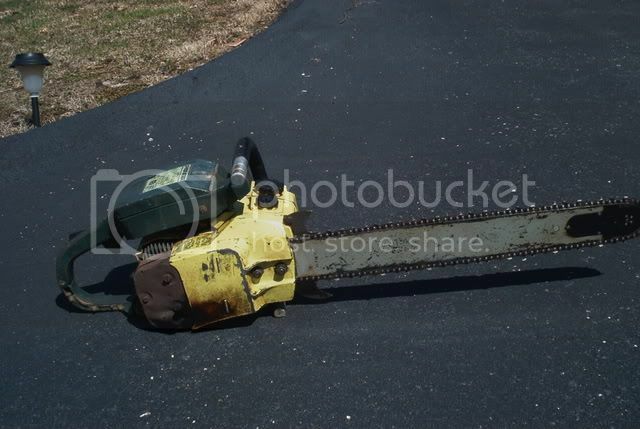 The saws I have are all running saws that are used. Personally, I like the P42's and P51's. Have lots of power for cutting the bigger stuff. As far as new parts, they are getting hard to get unless you can find a dealer that has been around for a long time and had a good stock. Some are still available from Poulan/Pro if you can find a good dealer that will take the time to look into the parts. 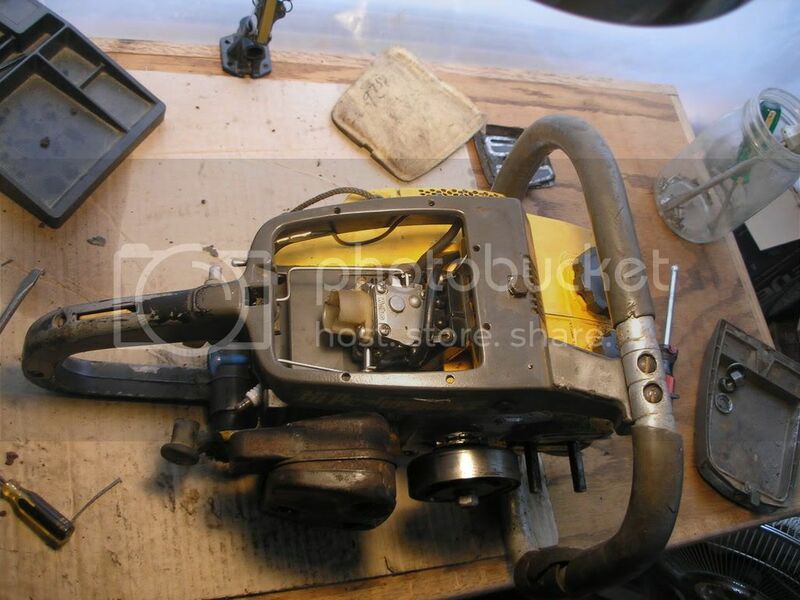 Keep an eye out on ebay, check your local saw dealers that may have taken in some on deals, etc. Have fun with your collection. A couple of my saws. i like those old saws myself,but finding parts can get really frustrating.I bought an old Pioneer 3200 a couple years ago that only needed a starter housing and an air filter.I couldnt find either,so I sold the saw on ebay.Its a shame,the little bit I ran that saw,I was amazed at the chain speed and power of a 1969 or 1970 model saw.Good luck in finding parts,I like to see them old geezers run. Finding parts for the Pioneers make them even more appealing for me to own and restore them. 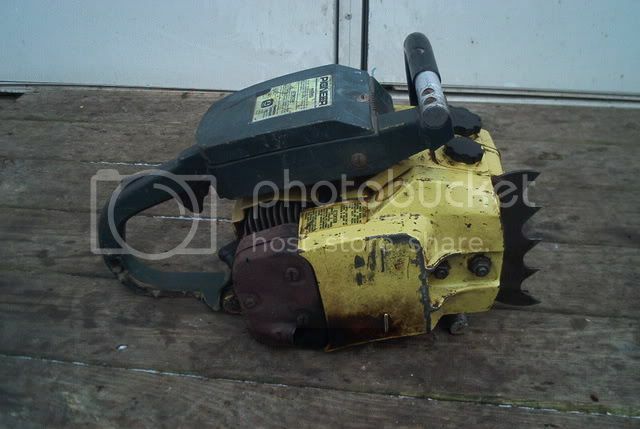 I like the older full metal saws and have them starting in 1948 as the forerunner of Pioneer was known as IEL and they were based in Vancouver Canada. I have too many models to list but am very partial to the 600 series of which I have them all and they range from 1957 to 1965.My newest Pioneer was a model 1450 from 1966 but have just come across an orange Farmsaw in really good shape. All my Pioneers are running saws that could go out and cut wood daily and have been rebuilt mechanically ,some are NOS and others are hardly used. It took me years to source out parts and make friendships among other collectors that has enabled me to find what I needed to build my collection. 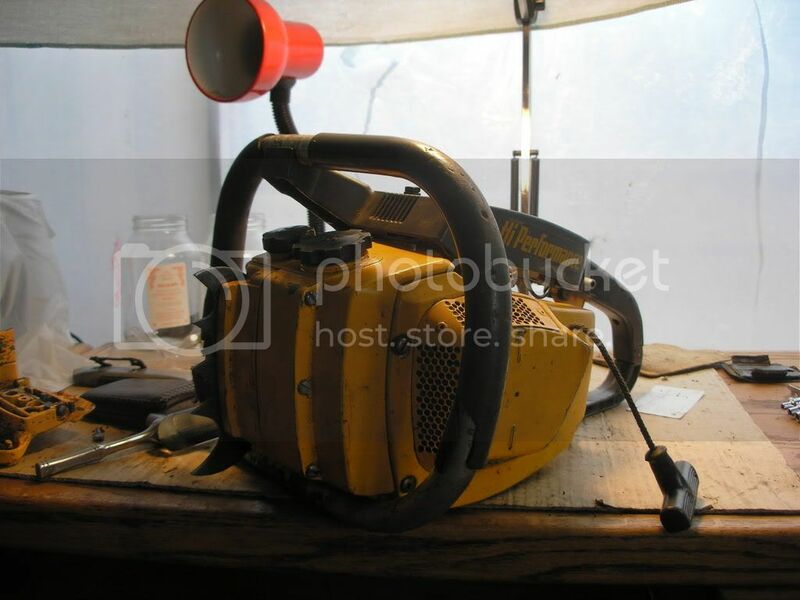 So if you are not in it for the long run and expect it to cost a lot of money for parts you probably should not collect the pioneer saws as there is no Pioneer part stores as such with a big inventory of new parts. IMO. p61 western, Welder56, Steve NW WI and 1 other person like this. Jacob J. and belgian like this. Sorry, screwed up post. I also have some newer Pioneers, P series, etc. but no pics yet. I am so jealous right now. That P42 looks so nice. It would look nicer if it was placed in some Doug Fir. Hey! Think you can mail it to me so I can try it out? You know, for old times sake. To get the feel of it back. I have a box full of those Pioneer 600 parts and other saws from the era. I have housings, some pistons, and points. Just to list a few. Newest saws in the lineup. From left: P39, P42, P42, Poulan Pro 405, P62. All are running and working saws, although they have been resting for the last few months. I really am grateful for you guy's sharing about Pioneer saws.One thing that has attracted me to these saws is what has been stated previously,that they first started out in Vancouver B.C. as IEL .Vancouver is a 45 minute drive from where I live now.I lived there till the end of the 4th grade.The fact that they continued to made in Canada after they were bought out is another plus.Made In Canada,that's getting rare real rare! thomas72 are you wanting to sell those parts ? Maybe pioneerguy600 would be interested or pioneerman perhaps.Pioneerman did you recently purchase a P42 from Halifax?It was listed for $250.00 obo. ?